This case study, prepared by Health Innovation Forum with contributions from Dr. Alain Larouche and Ms. Guylaine Chabot from the Concerto Health Group, as well as Mr. Louis Larouche from Bell Business Solutions looks at how the Concerto Health Group brought technology and pharmaceutical partners together to support multidisciplinary primary care teams in Lanaudière, Québec. — Produced as part of the series "Partnerships to Enhance Health System Performance." More and more people are now living with one or more chronic diseases, and exacerbations of these diseases account for a large portion of Emergency Department (ED) visits and hospitalizations. Finding ways to manage chronic diseases outside the hospital system is a priority. Family doctors who wanted to take on chronic disease management in their population. A regional healthcare centre (CSSS) willing to collaborate with family doctors. An interdisciplinary team equipped with care pathways to guide each team members’ work. An information system accessible to all those involved in a patient’s care. Along with Dr. Bédard, they formed the Groupe santé Concerto (Concerto Health Group) to develop strategic clinical alliances and electronic care pathways conceived for interdisciplinary practice in family medicine. “Health system administrators don’t know what happens in the doctor’s office,” says Dr. Larouche. “What they do know is that 80% of people over 65 who receive a prescription receive it from a family doctor.” And yet there is no evidence on whether guidelines are being followed, according to Dr. Larouche. Their aim was to create the necessary starting conditions in one region of Quebec, work with a group of family doctors there to implement a model of care based on the pathways and integrating an interdisciplinary team. They would then evaluate the impact on patient outcomes and health service usage, with the ultimate goal of seeing the model adopted by family medicine groups throughout Québec. Pharmaceutical companies are also being challenged by the Institut national d’excellence en santé et en services sociaux (INESSS) to demonstrate the cost impact of a new treatment. “INESSS wants documentation on loosely defined societal costs,” says Ms. Chabot, “and this information can only come from population-based real-world studies with data captured in an optimal healthcare context.” A number of companies, including Sanofi, Astra Zeneca, Pfizer, Bristol-Myers Squibb and Shire, provided funding to enable Groupe santé Concerto to develop the care pathways. Dr. Larouche also approached Bell, in particular veteran health information expert M. Louis Larouche (no relation) who had previously worked at X-Wave, a company devoted to health informatics with a long history in Québec. 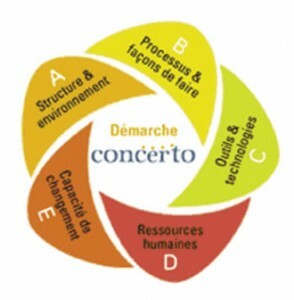 What Bell brought to the table was the information system and the ability to computerize the complex care pathways designed by the Groupe santé Concerto. This would enable them to run on an information system that could easily be used by different members of the interdisciplinary team and could adapt to individual patient needs no matter how many concurrent chronic diseases they had. The CSSS du Sud de Lanaudière was very interested in partnering with the Groupe santé Concerto to implement the new model and they entered into a formal agreement in June 2010. Dr. Bédard had previously worked as Director of Professional Services there and had the trust of local physicians. Groupe santé Concerto approached three family medicine groups representing some 30 family doctors with a combined population of 50,000. The ASSSS Sud du Lanaudière came on board to support the effort. Groupe santé Concerto also gained the support of the Ministry of Health and Social Services, which entered into an agreement formalizing the partnership and recognizing the contributions of private sector partners. In June 2010 an agreement between the CSSS, ASSS, Ministry and the Groupe santé Concerto was officially signed to collaborate on implementing a two-year demonstration project and study the results. A legal framework for use of patient information was carefully designed. “For the first time,” says Dr. Larouche, “we would have an exchange of information between doctors’ offices and the hospital.” Clinical personnel would have varying degrees of access to the data, while Groupe santé Concerto would be authorized to analyze the data only after it had been stripped of identifiers. The time appeared perfect for making full use of the multidisciplinary team. Quebec laid the groundwork for interdisciplinary teams in 2003 when the professional codes were redrawn and the notion of exclusivity gave way to fields of practice. That change enabled the introduction of “ordonnances collectives,” prescriptions initiated by the doctor that could be monitored and modified in terms of dosage by nurses and pharmacists associated with the family medicine group. The CSSS “loaned” the allied health professionals and primary care nurses to the family medicine groups participating in the project. The Bell Chronic Disease Management information system was linked to the family doctors’ existing electronic medical records, and the multidisciplinary team used these electronic care pathways to provide optimal management of chronic diseases. The model encourages family doctors to turn most of the care for their most vulnerable patients over to other members of the interdisciplinary team: nurses, nutritionists, pharmacists and other allied health professionals. The GP sees patients periodically, is responsible for referrals and for initiating the “collective” prescriptions. The different care providers all enter information into the patient’s record, but the physician remains in charge of the record and uses the information contributed by the multi-disciplinary team to design and adjust the treatment plan. The demonstration project was meant to run from January 2011 to March 2013 and an independent researcher assessed a number of measures at the 18-month mark in June 2012. Patient satisfaction was over 85% on all 10 measures, and fully 99% of patients stated they were provided treatment plans they could implement in daily life. Adherence to best practices reached 81% for dyslipidemic patients, 88% for diabetic patients and 94% for hypertensive patients. Among the 58 “frequent flyer” patients who had three or more hospitalizations in the three years before they were enrolled in the project, the implementation of individualized intervention plans avoided 56 bed days and 16.2 ED stretcher days during the 90-day period over which project data were collected, compared with trends in the previous period. This reduced expenditure growth in the local hospital and the health network. Dr. Larouche and Ms. Chabot are disappointed at the persistent barriers to improving access to effective primary care, which they see growing higher. The most important roadblock is resistance to change. The second is financial: the idea of investing to produce efficiency gains has given way to a spend-a-dollar-save-a-dollar requirement. Risk-sharing models for new pharmaceutical products have been replaced by negotiated price discounts, reducing the incentive for pharmaceutical companies to support efforts to demonstrate system savings. The Groupe santé Concerto is compiling final results from the Lanaudière Sud project, and is preparing to publish a study on the “maturity index” it developed to assess readiness for change in a family medicine group and health region. They are now working with the director of the ASSS in Abitibi-Témiscaminque to improve readiness for chronic disease management in that region. Dr. Larouche and Dr. Bédard would like to integrate some of their work into the training of new doctors and see the care pathways validated by a university partner. Companies remain interested in the analysis of complete primary care data validated by independent researchers, as it will enable them to better understand the optimal management of medication for patients suffering from multiple chronic diseases as well as the societal costs of chronic disease. A general practitioner by training, Dr. Larouche is particularly interested in establishing a clinical organization adapted to the needs of vulnerable clienteles with chronic illness. Ms. Chabot has a BA in Psychosociology of Communication and a Master of Public Administration. 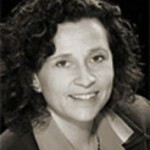 She has 20 years of experience in strategic communication and project management related to health care. 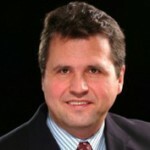 Mr. Larouche is a pioneer in health solutions in Québec, previously working as regional director with the company Xwave.